This document was issued in Bath, Maine to the vessel Industry, which was under the command of Henry Palmer of Massachusetts and had a carrying capacity of 416 tons (known as “burden” or “burthen”). The vessel was heading from Bath, Maine to Cape Francoise (Haiti) with a cargo of lumber including boards and planks, shingles and other timber. This sea letter/ships’ passport is in four languages: French; Spanish; English; and Dutch. 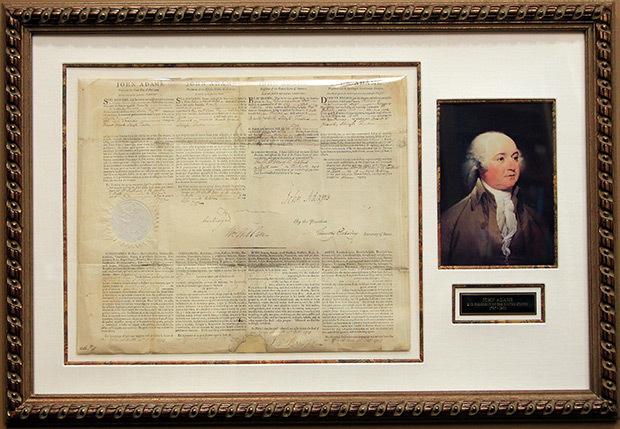 It is signed early in his term by President John Adams who served one term from March 4, 1797 to March 4, 1801. Adams’ time in office focused on establishing proper respect for the young United States. When France refused to receive American envoys unless individuals identified as “X,Y, and Z” were paid large bribes, a Quasi-War with France began. In response to this “X, Y, Z Affair”, Adams spurred Congress to complete three powerful frigates, which began to defend America shipping. After several American victories at sea without a declaration of war, France backed down and received envoys with respect. The Quasi War was ended after long negotiation. The document is also signed by the controversial Timothy Pickering who had been appointed by Washington after maneuvering his predecessor Edmund Randolph out of office. Pickering opposed President Adams’ actions over the Quasi-War with France and other issues. When the frustrated Adams asked for Pickering’s resignation, the Secretary of State refused, and Adams then dismissed him on May 12, 1800. Also signing the document was William Webb, a prominent merchant of Bath who served a long term as Collector of Customs from July 31, 1789 until 1804. Another signer was Daniel Sewell, a Justice of the Peace in Bath. The document is printed on rag paper and bears the Great Seal of the United States on the center left.